This first installment of the Hasty Gourmet series includes 300 healthy, savory dishes that are sure to please without requiring lots of time in the kitchen. From appetizers and soups to entrees and desserts that span Asian, Hispanic, and Mediterranean influences as well as traditional American comfort food, these recipes use readily available ingredients, have easy-to-follow directions, and take less than 30 minutes to prepare. Although created specifically for those required to monitor their salt intake, the majority of recipes are also low in fat and cholesterol- and sugar-free. Each recipe contains a complete listing of the nutritional information and total sodium content per ingredient. 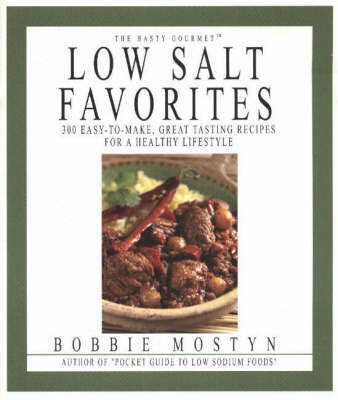 Hints on stocking a low-salt pantry, general cooking techniques, food labeling guidelines, and calorie and nutrient vignettes help make the switch to low-salt cooking easy and delicious.